Desert Peak, located in north Phoenix just minutes from the Desert Ridge Marketplace, is a master planned community developed predominantly by DR Horton. The community is nestled in an area surrounded by Sonoran Desert and foothills, most of which are state trust owned land. The foothills offer hiking and mountain biking trails for residents to enjoy the desert beauty. In addition, Desert Peak features beautiful walking trails throughout the master planned community and several parks for residents to enjoy. Located 2 miles north of the 101 and just a few miles from the 51 and I-17 freeways make this an ideal community for people who need to commute to many areas of the Valley. Coupled with its close proximity to the Desert Ridge Marketplace, City North and Reach 11 Sports Complex, this community is one of the most desirable communities in north Phoenix. The schools, Boulder Creek Elementary, Mountain Trail Middle School and Pinnacle High School in Paradise Valley Unified School District are all highly rated schools. In fact, last year Pinnacle High School was for the 3rd time ranked in Newsweek Magazine's top 1200 high schools in the nation, this time coming in at #298! Consisting of both condominiums and single family homes, Desert Peak has many options to fit all lifestyles and budgets. The Pinnacle at Desert Peak is a gated condominium community of approximately 350 units with both one and two story options ranging from just under 1100 sf to just under 2000sf. The community features a pool, parks and easy access to a variety of walking trails for residents. Most of these condominiums were built 2008 or later including a small portion still to be completed in 2013. 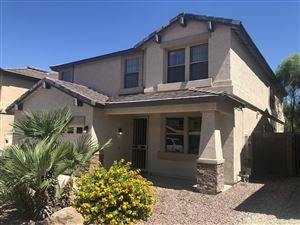 Desert Peak's approximately 640 single family homes, built between 2007 and 2008, offer a variety of sizes and spacious floor plans from about 1700 sf-5000sf. The single family home portion of Desert Peak is broken into four sections, labeled Desert Peak I, II, III and IV each of which features some different floor plan options and a variety of elevations to add visual interest to the community. Call me today at 602-980-9098 for more information on homes in Desert Peak! Listing courtesy of Desert Nation Realty, L.L.C.